The Treaty of Yedo of 1858 provided for several Japanese ports to be opened for trade: Nagasaki, Hakodate and Kanagawa/Yokohama from 1859, Niigata from 1860, and Osaka and Hyogo (Kobe) from 1863, both later delayed to 1868. British subjects were given the right to reside in these ports, to lease ground and to purchase buildings. The foreign settlements that grew up in these ports were exempt from the jurisdiction of local law, an arrangement known as extra-territoriality. At Nagasaki, in the southern island of Kyushu, the first consulate was in the Myogoji temple, which stood on the brow of a hill in Minami Yamate. The accommodation had its drawbacks, with just two small rooms, plus bathroom and kitchen, and initially only paper windows to keep out intruders. The siting of the foreign settlement was agreed in 1860 and the land parcelled into lots and sold. A new consulate building [? Lot number] was completed in the settlement in 1864. 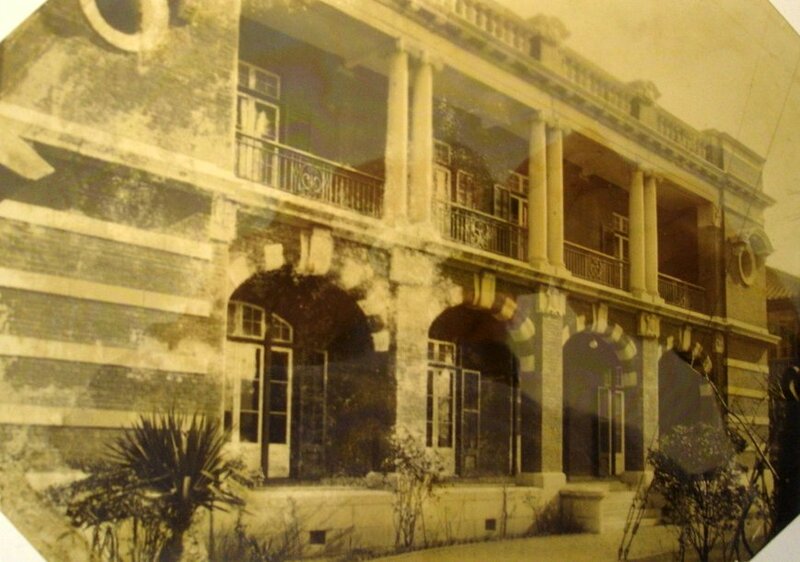 In 1868, Lot 9 (later called 9 Higashiyamate) was bought from Messrs Dent, and the house on it became the consul’s residence until it was damaged by a typhoon and the consul moved into rented accommodation. Lot 8 was acquired in 1874 and lots 10 and 13 subsequently. Together these lots formed what was later referred to as the old consulate site. A new consulate site, complete with buildings for office, assistant and constable, was bought in 1884 at lot 6 (later 6 Oura): it occupied a commanding position on the bund, facing the harbour. This acquisition enabled the old consular site to be sold by auction in 1886. 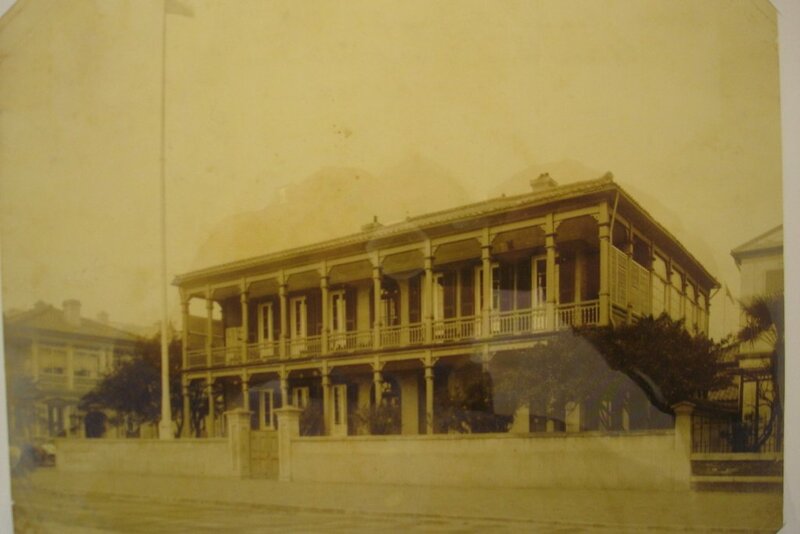 The new consulate site was transferred to the Office of Works in 1903 and the consulate was rebuilt in 1906-08 (during which period the consulate decanted to 47 Oura) by William Cowan in the Shanghai office of the Office of Works. The consulate closed in 1941, and the property was sold to the city of Nagasaki in 1955, where it housed a science museum until 1996, when it was designated an Important Cultural Asset. Today the building houses [?what]. At Hakodate, at the southern tip of Hokkaido, Rutherford Alcock managed in 1859 to lay claim for the consulate, after a great tussle, to the best of the four available temples. 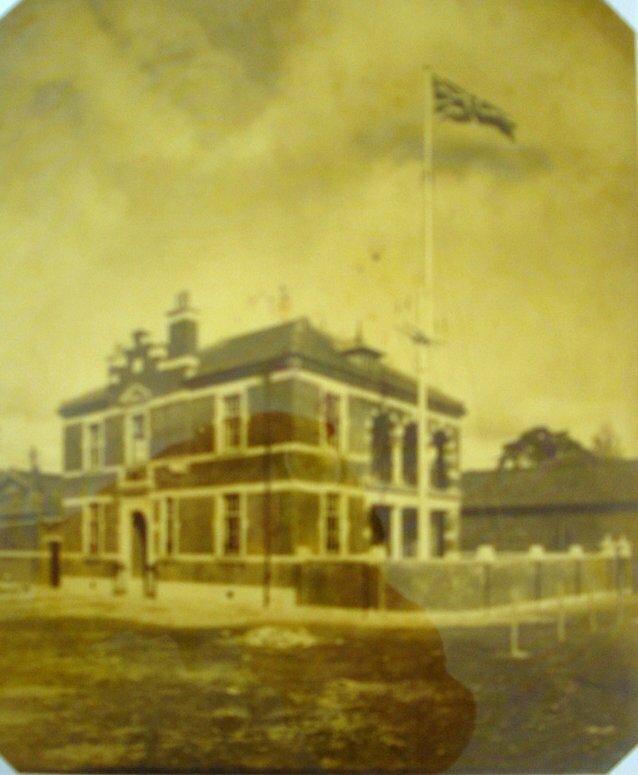 ‘On the ninth day after my arrival … a fine flag-staff, with the assistance of the Highflyer’s men, was got up, and the Union Jack was hoisted with a royal salute from the squadron, to mark the first time the flag had floated over a British consulate in the port’. The whereabouts of the succeeding consular accommodation is unclear, but it was destroyed by fire in 1879. A rationalisation of sites was agreed in 1880 by which the Japanese government would remove the foundations of the destroyed residence to within a new one-acre enclosure. A one-storey residence was completed on this site in 1883, with office and constable’s quarters. This building was destroyed by fire in 1907 and a new two-storey building was completed in 1913 at a cost of £4,250. The residential part of the building was sublet in 1929, and the whole property sold to the Hakodate Municipality in 1940. The Anglo-Japanese treaty of 1858 stipulated that Osaka should be opened for trade in 1863 but this date was later put back to 1868. The foreign settlement was designated at an area known as Kawaguchi, just outside the city, near marshland and bounded on three sides by water. Osaka never matched Kobe, only twenty miles to the west, in attracting traders, mainly because its port was inferior for large vessels. A vice-consul was appointed in 1868 but no consulate was leased or built by the British government and Boyce made no mention of Osaka in his 1899 report. A site of 230 tsubo was eventually bought in 1913 at 35 Kawaguchi-cho from Messrs. Sale and Frazar for £2,620. 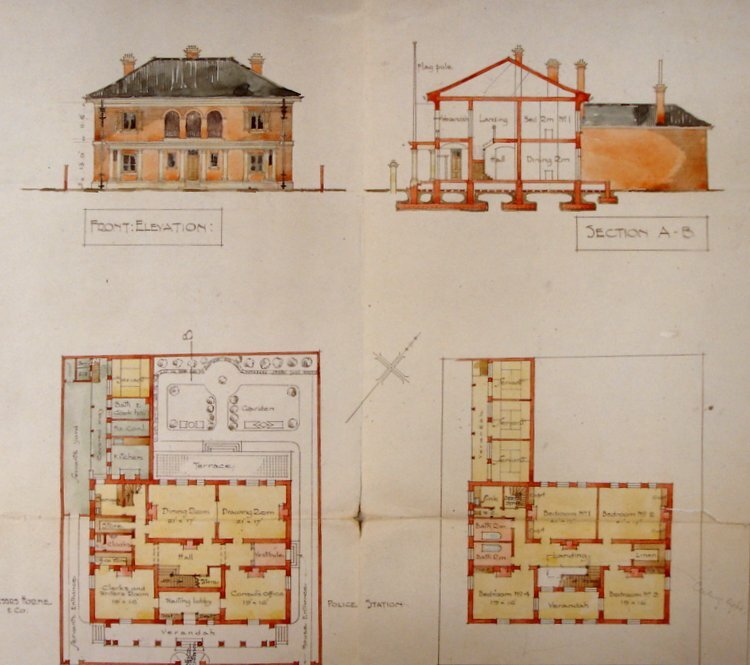 H Ashmead, the Office of Works architect in Shanghai, produced a scheme for a consulate building in the same year, which Sir Henry Tanner, his architectural chief in London, adjusted before it was built. Quite a handsome consulate building was completed in 1914. By 1918, however, the area had become intolerable for Europeans and consuls lived and worked in leased premises for the next 35 years. 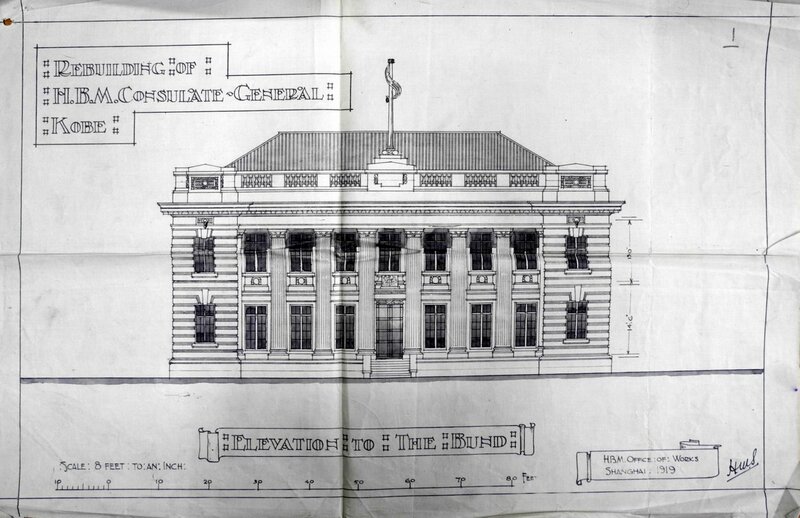 The former property was sold to the Settonyo Bank in 1920. In 1955, a two-storeyed wooden, tiled-roof house known as the Andrew Weir house, also as The Folly, at 12-27 Kurakuen Liban-Cho, Nishinomiya-Shi, was bought with its contents for about £8,500 as the residence of the consul-general. It had previously been leased, and an adjoining site had been bought in 1954. The Folly was sold in 1980 and the residence moved to 16 – 2 Roku Roku So-Cho, Ashiya. By 2006, it was at 3 – 1 Yamate-cho, Ayashi-shi. The offices were leased from at least 1929 in Osaka Building, Soze-cho, Kitaku. By 1961, they had moved to the Hong Kong and Shanghai Bank Building at 45 4-chome, Awaji-Machi Higashi-ku where they remained until at least1984. By 2006, they were on 19th Floor, Seiko Osaka Building, 3-5-1 Bakuro-machi Chuo-ku. The Anglo-Japanese treaty of 1858 stipulated that the port of Hyogo should be opened for trade in 1863 but this was later put back to 1868. The village selected as the treaty port was just around the bay from Hyogo and came to be called Kobe: the settlement site was laid out by a British civil engineer called Hart. The first consulate was standing near the custom house in 1868. Another compound, with a good house on it, was bought from a merchant in 1872 and the house adapted to residence and offices. It was transferred to the Office of Works in 1875. The buildings had become unsafe by 1919 and in that year the consulate moved to leased premises [?Osaka Shosen Kaisha Building, 5, Kaigandori]. Half the vacated site was sold, and the retained half, pending new buildings being erected on it, was leased to a Japanese contractor to store materials. The idea of re-building then fell into abeyance and the value of the retained site increased greatly, to the extent that in 1933 it was sold. A deal was done with the Chartered Bank of India, Australia and China by which the bank bought the site and, in part exchange, granted a 21 year lease for consular premises at 9, Kaigon-dori Ikuta-Ku. The Post closed around 1970. The port at Niigata never took off: the consulate eventually opened in 1869 but in that year the only trade had been with other Japanese treaty ports and there were only seventeen resident non-Chinese foreigners, none of them British. Shimonoseki and Moji, on either side of the straits between Honshu and Kyushu, were opened to trade in the late 1890s, but were slow to develop. A site was leased in Shimonoseki for fifty years renewable in 1905 and consular and shipping offices built on it in 1907 by William Cowan, of the Office of Works’ Shanghai office. 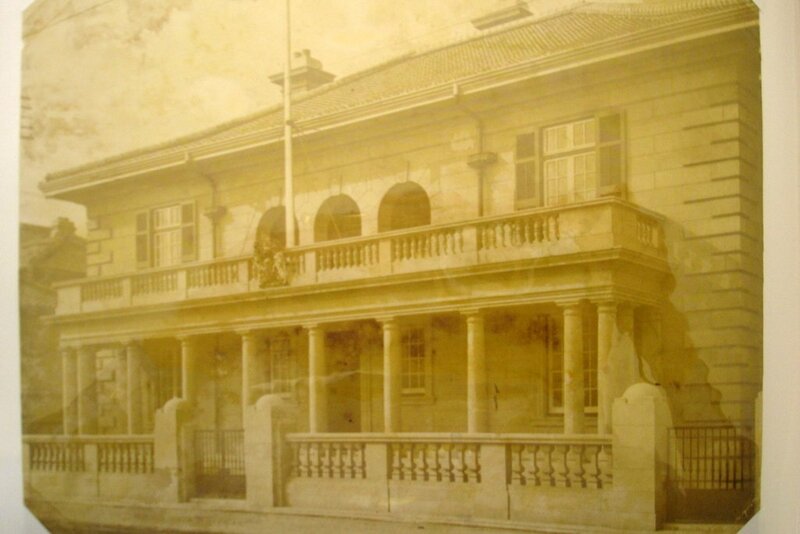 The consular post was abolished in 1922, and the property was leased from 1929 to a commercial firm for as long as one of their staff was the British consular agent in Shimonoseki, and sold in 1953. 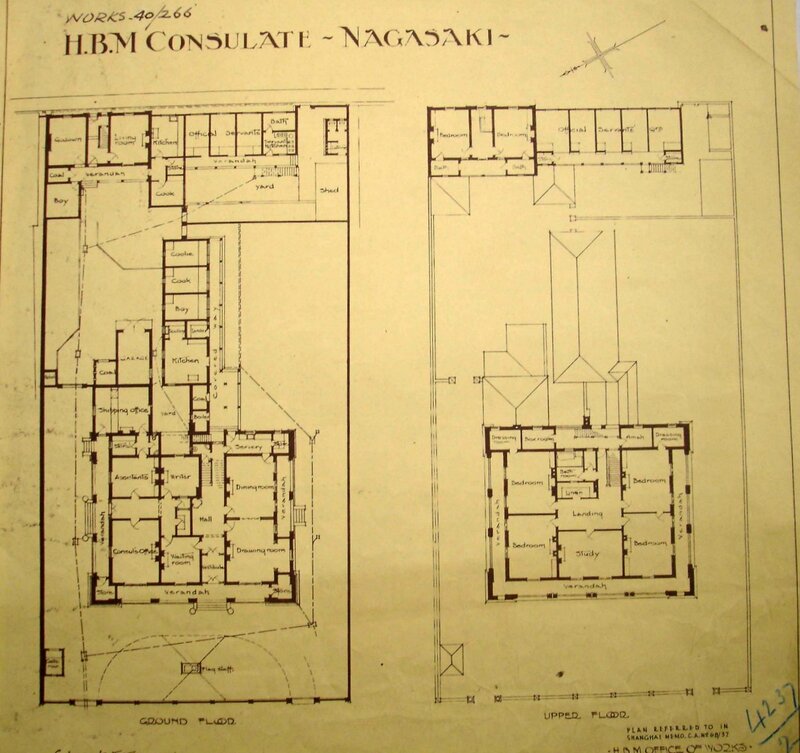 Early proposal for new consulate at Nagasaki, 1903. 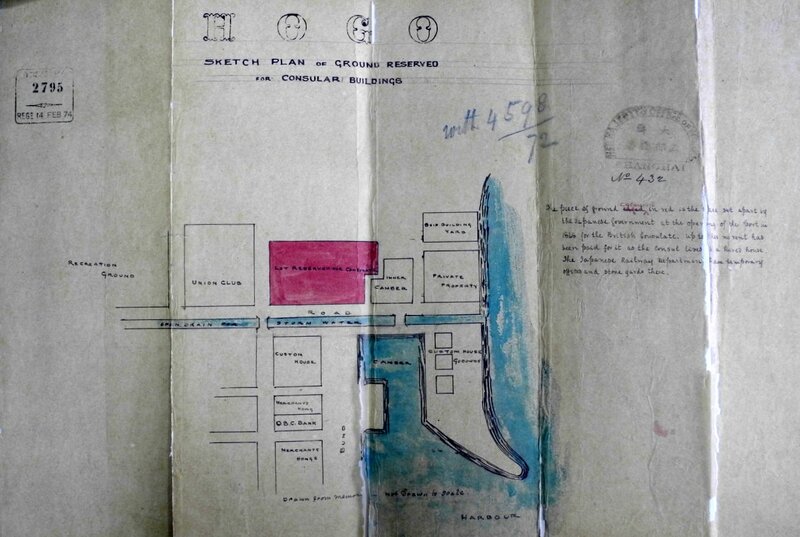 Site plan of rebuilt consulate, 1912. Rebuilt consulate at Nagasaki, c. 1915. 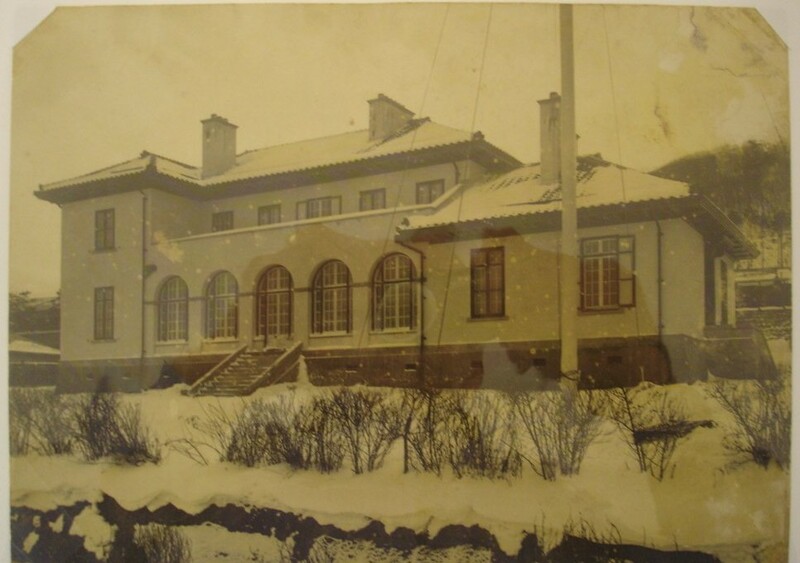 New consulate building at Hakodate, completed 1913. 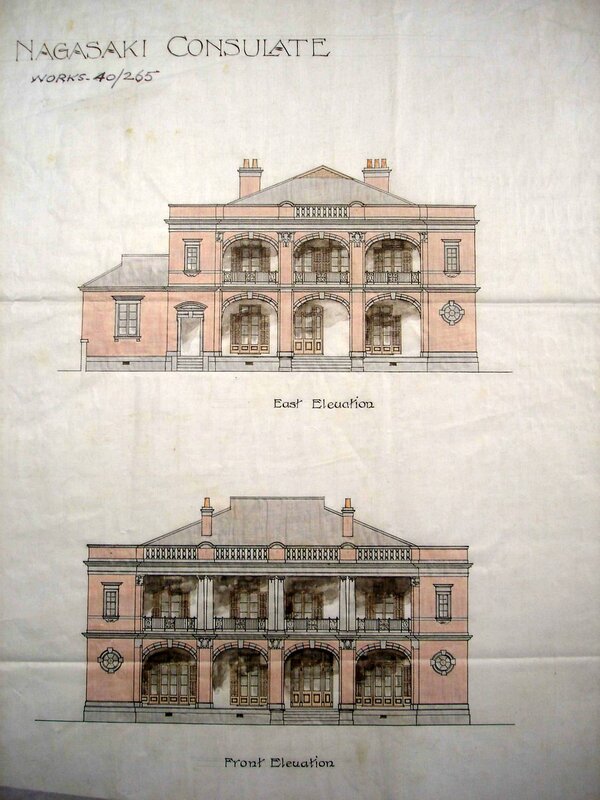 Drawings for the new consulate building at Osaka, dated 1913. New consulate at Osaka, completed 1914. Location of site selected for consulate at Kobe in 1868, close to the Custom House. Consulate adapted from house bought in Kobe in 1872. This photo 1911. Unexecuted design of 1919 for a new consulate at Kobe on half of the former consular site. 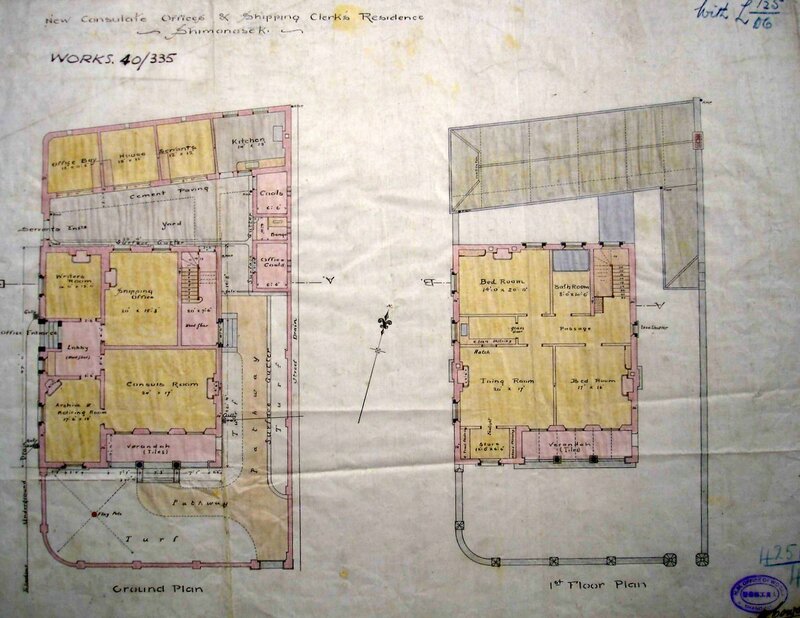 Plan of consular and shipping offices at Shimonoseki, dated 1906. Consular and shipping offices at Shimonoseki, completed 1907.